Erik Reece’s Lost Mountain is a no-holds-barred vilification of current mountaintop removal coal mining practices. He follows the course of several businesses who purchase and re-sell the permit to strip mine Lost Mountain in Eastern Kentucky from September 2003 to September 2004. Along the way, he reports on past court cases involving mining companies, how the law is bent to accommodate mining practices, and whether there are real, useful, sustainable ways to extract coal from mountains. His clandestine tracking of coal mining operations gives the reader a different perspective on the industry and while his rhetoric is decidedly anti-business, he is not totally against the idea of collecting coal for power. The problem is that the book is overwhelmingly sad. From a month-by-month discussion of how Lost Mountain is basically removed from the map to vignette after vignette of families and communities that do not have the money or the methods to fight back while groundwater is poisoned and homes are flooded by mining runoff, this will get your invective juices flowing. 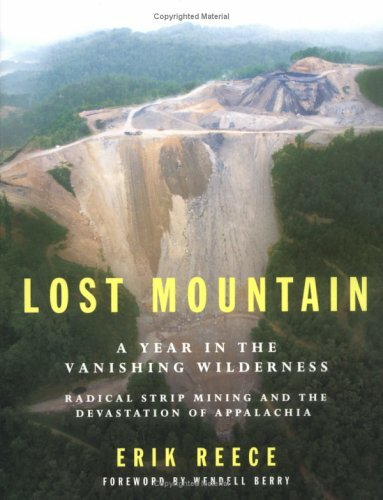 A revealing look at the horrors of mountain top removal mining. I live in the Appalachian foothills of Ohio. My great-grandfather mined coal on and off for much of his teens and twenties, often on his hands and knees in an underground shaft (he was usually too tall to stand at 6'6"). His family, including my grandmother, lived in company towns that conspired to keep their people poor and dependent. To this day, if you live in my home county, you must have mine insurance, because if your house is built over a mining shaft, sinkholes can develop unexpectedly (this happened to one of my professors in college). In 1995, a twelve foot section of Interstate 70, a major interstate, collapsed in the county next to mine because of mine subsidence (google "Interstate 70 collapse Ohio 1995"), which took months and millions of dollars to repair. But that kind of mining is a whole different beast, something that many people don't seem to understand (or don't care to). As bad as it could be, underground mining did supply jobs - often poorly paid and dangerous - and wreaked less environmental damage than strip mining. Strip mining, unfortunately, I've seen as well. I've seen the Big Muskie (now no longer in operation). I've helped "reclaim" old strip mining swaths by planting trees provided by AEP, who did most of the strip mining in my area. AEP, I must say, treated us better than those in Kentucky and West Virginia are often treated (by companies other than AEP). One large strip mined area was turned into an African wildlife preserve (no, seriously - The Wilds in Muskingum County, Ohio) that generates tourist dollars. But I can show you creeks that run orange and wells that went bad (including some on relatives' properties) because strip mining allowed chemicals to leach into the water. And we are the "lucky" ones because, as I said, AEP treated us fair in the clean up. Strip mining is reckless, dangerous, and stupid. It takes entire mountains and levels them to the ground. It puts fill in hollows. It poisons rivers, streams, and wells. It kills wildlife. It destroys topsoil. It ruins houses and communities. It creates potential disasters just waiting to be unleashed on the people downstream. And all in the name of cheap energy. Strip mining isn't cheap. Oh, sure, the operation itself is. The companies come in, take all the coal, usually claim bankruptcy in the end so they don't have to reclaim the land, and leave giant swathes of dirt in their paths where mountains once stood. Even if they do "reclaim" the land, it's usually just a "pasture" where not much will grow because the soil is so poor and rocky. People say - but what about the jobs? Yeah, what about the jobs? Strip mining requires few employees, and almost none of them are local. If you think strip mining is employing hundreds of local people who wouldn't have jobs otherwise, you have no idea what is going on in the mountains. And if you think that EPA protects anything or anyone besides the coal companies, you also have no idea what is going on in the mountains. The EPA and the coal companies go hand in hand; the EPA is often run by people who were formerly in the coal business. Think about that one for a while. It's true, and honestly, that thought gives me some comfort. Humanity will likely kill itself with pollution and environmental damage, but we did it to ourselves. Mammals may not survive; most of the species we see now may not survive, and for that I am sad. But the earth itself will survive our carnage; it's got billions of years left before the sun swallows us whole.